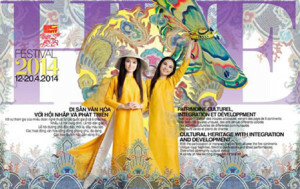 Org anizers of the Hue Festival have just revealed the publicity poster for the 8th Hue Festival to be held in 2014. The festival is scheduled to take place from April 12-20 next year and expected to will attract thousands of domestic as well as international visitors. So far, among those taking part are many Vietnamese art groups and about 26 groups from other countries. During the festival, many interesting activities will take place to enhance and highlight the cultural traditions of Southeast Asia.